With the Destini 125, Hero Motocorp has entered the highly-competitive 125cc scooter segment in India. However, with a rather late entry, the Destini 125 will have to bring its A-game to rival the likes of Honda Activa 125 and TVS NTorq. Hero MotoCorp, with an intent to bring more higher-engine capacity models to its lineup, has launched the Destini 125 scooter in Delhi-NCR at a starting price of ₹ 54,650. Available in two variants (Lx and Vx), the higher Vx variant has been priced at ₹ 57,500 (Ex-showroom). 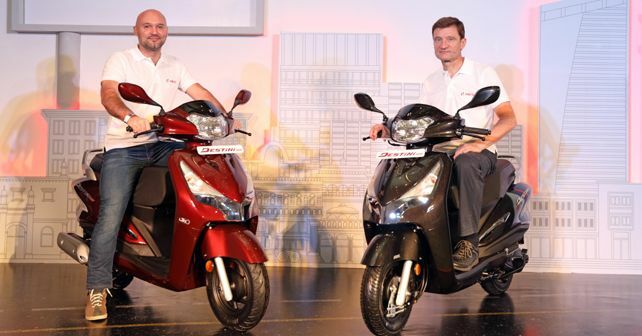 Apart from marking Hero MotoCorp's debut in the 125cc scooter segment, the Destini 125 is also the first and only scooter in India to feature Hero's idle stop-start (i3s) system which will help the scooter in achieving some really good fuel efficiency figures. The Destini 125 draws its power from a new, 125cc Energy Boost engine, with an output of 8.7bhp @ 6750rpm and maximum torque of 10.2Nm @ 5000rpm. In comparison, the new powertrain offers 17% higher torque and 9% more power than the company's 110cc power units. Apart from the segment-first i3s technology, the Destini 125 also features a digital-analogue speedometer, a side-stand indicator and a service-due reminder for ease of use. Some other convenience and safety features available with the Destini 125 include an external fuel-filling system, remote key opening, telescopic suspension and an integrated braking system. On the Vx variant, a mobile charging port and boot light will be offered as standard equipment. 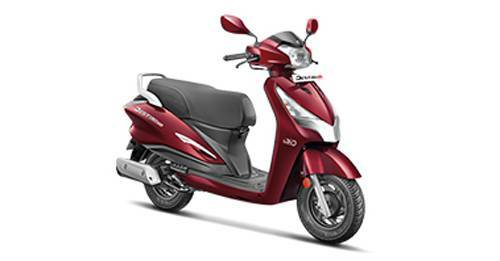 In terms of styling, the scooter comes with a full-metal body, signature tail lamps and indicators along with body-coloured mirrors. On the top-spec Vx variant, standard styling options include a dual-tone seat cover, a chrome chest on the front fascia, cast wheels and chrome garnishes on the side panels. The Destini 125 will be available in four premium metallic colour options - Noble Red (only with Vx), Chestnut Bronze, Panther Black and Pearl Silver White.